RootsTech is just around the corner. For those of you arriving early, why not stop and join in the fun as once again we will broadcast Mondays with Myrt *live* from the Family History Library in beautiful downtown Salt Lake City, Utah? We will set up beginning at 9am, in the 3rd floor glass-enclosed conference room. Mr. Myrt will have his clipboard, and we'll cycle in 4-6 people at a time for interviews. 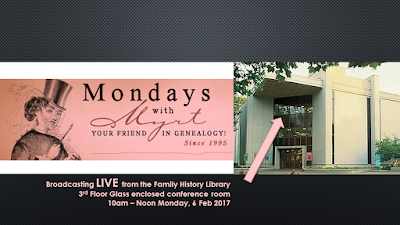 It's always fun to discover what folks are doing in their research, how their local societies are growing, and what they plan to do and see at #RootsTech later in the week.